List your business in our Australian business directory now! 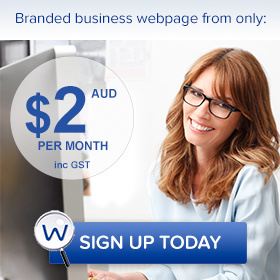 It's now affordable for small business to advertise in an Australian business directory! List your small business in our business directory starting at only $2.00 per month. Full page business listings. Small and large business can apply for a listing in this business directory. 100% Australian quality businesses only. 100% Australian owned and run. A business directory by Australians for Australia. See our NEW and UPDATED pricing plans here.